The appeal of Lovecraftian horror lies in our innate fear of the unknown. If we don’t understand something, naturally we are afraid of it. This concept has led many horror games to try their hand at capturing that fear with mixed results. Enter Sunless Sea: Zubmariner Edition, a new horror title for the PS4 that promises a rich world full of both mystery and horrific things hiding in the depths of its ocean. Does this game, set in a larger universe, manage to capture the oldest and most powerful kind of fear? Let’s find out. 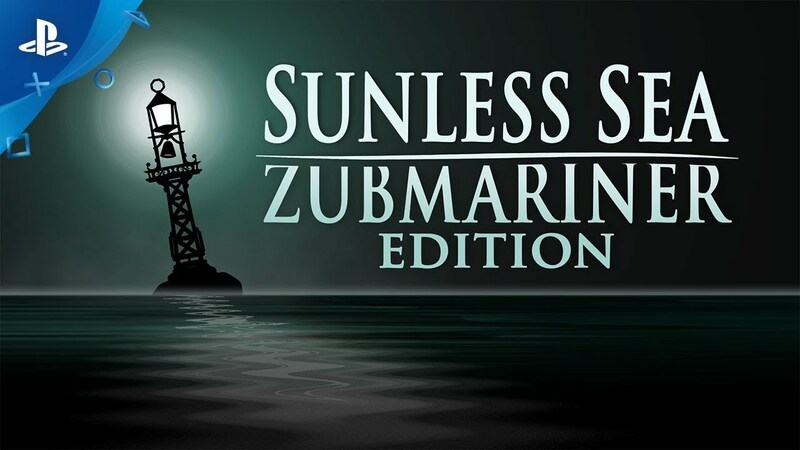 Sunless Sea: Zubmariner Edition is a game set in the Fallen London universe, which has immense popularity among the players who have delved into the browser-based experience. With a rich lore and plenty of superb writing, this game has a lot going for it long before you decide to take up your role as the captain of a ship. Set in the city of Fallen London, the year is 1888. A city that once sat comfortably on the surface of the world has since been stolen by bats and dragged into to an abyssal part of the planet known as the Neath. The city’s coast borders the Unterzee, a vast ocean filled with pockets of life and teeming with things that make your nightmares look like a children’s show. You play as a Zailor, the captain of a ship with a backstory of your choosing. Your goal? Explore the Unterzee and bring back the stories you experience. Your tales can literally fuel your journey as selling them will yield profits for supplies and fuel to keep your ship going. Other tasks and opportunities will present themselves as well, but your main goal will be keeping yourself and your crew alive. Beyond these currencies, Sunless Sea will also force you to watch your crew’s terror levels, which rise as you delve deeper into the darkness. Keeping this in check by leaving the lights on, making smart decisions, or giving them shore leave, will also be a major part of your strategy if you intend to survive. The story in Sunless Sea is conveyed entirely through text, and while that may seem like a bore, the game does a stellar job of dolling out the reading in bite-sized pieces. Not only that, but the writing itself is positively amazing. Some games will bog down their lore and explanations in long-winded descriptions, and while there’s plenty here to talk about, the writers of Sunless Sea wisely offer up concentrated bursts that give you just enough to paint a mental picture without talking your ear off. It’s an exquisite balance, and as I writer myself, I know how hard it can be to accomplish. Even with the excellent storytelling and world-building, keep in mind that Sunless Sea isn’t going to be a game for everyone. Those who don’t enjoy reading a lot of text, or thumbing through a ton of menus will quickly become bored with the gameplay loop. Combat is here, but it’s fairly simple and if you’re smart, you’ll avoid it in the early hours. Docking at ports will offer you the chance to explore, learn more about the area, or pick up additional quests and visit the shops. Running out of supplies is a very real possibility, but in cases like that, you can, ahem, find food elsewhere amongst your crew, if you get my drift. Running out of fuel is going to be the one thing you won’t come back from. When you do meet your end, you can choose what gets passed on to the next captain. For me, this was always the map I had revealed, but there are several choices for how you pass on your lineage. Beyond exploring the surface of the Unterzee, you’ll also have the chance to dive beneath the surface, thanks to the included Zubmariner expansion in this package. The quest to get your ship upgraded for underzee travel is given to you from the beginning, but it’s quite the feat. When I first arrived in the hopes of getting the upgrade, I was hit with a massive fetch quest to get everything I needed to complete the upgrade. Does it make sense? Yes, absolutely, but I would have liked the ability to get this major gameplay upgrade sooner rather than later. Once you do have it, though, the ability to dive beneath the surface adds a lot to the gameplay. Not only are the underwater areas far more claustrophobic and haunting, but they offer plenty of new quests, lore, and terrors to contend with. Having the expansion included in this version of the game is a really nice touch on the developer’s part. Being a rogue-like, the game encourages you to play without the ability to manually save, but this is an option regardless. Doing so will prevent you from earning a specific trophy, but otherwise doesn’t affect the gameplay. While it may not be for everyone, due to the slow pacing and extensive reading, Sunless Sea: Zubmariner Edition does offer an incredibly realized world and plenty of things to keep a curious captain happy. While more gameplay mechanics, deeper combat, and surface exploration could have really enhanced the experience, what’s here is more than enough to satisfy any Lovecraftian horror lover or tabletop gamer. Speaking of tabletop, Sunless Sea: Zubmariner Edition really does feel like an interactive tabletop RPG, and I mean that in the best way possible. The isometric perspective, subtle animations, and interactive menus all bring the world to life, and thanks to the writing, you’ll be able to picture anything not present on the screen. The atmosphere is thick, thanks to haunting music and a constant mixture of darkness and fog always shrouding the path forward. Ultimately, like any other rogue-like, you’ll need to give Sunless Sea: Zubmariner Edition plenty of time to teach you everything, as the tutorials are only enough to really get your foot in the door. Once you’ve gotten a few unfortunate captains under your belt, and access to the depths in your Zubmariner ship, you’ll find that the search for answers, lore, and the pursuit of the unknown is an infectious habit you won’t soon be able to kick.